Wilcon Depot, a leading home improvement, and construction supplies retailer, recently launched its digital store in a bid to bring a more innovative and convenient shopping experience to its customers. Create something beyond the ordinary. At the launch of Wilcon Depot’s digital store in Mandaluyong City, were (from left to right): Rupert Jacinto, Roselle Rebano, Tina Jacinto, Wilcon Depot SEVP-COO Rosemarie Ong, Tessa Prieto-Valdes, Philip Cu-Unjieng, and Johnny Litton. Through the introduction of an online shopping site, Wilcon is marking the first time that its wide array of product categories ranging from appliances, automotive, building materials, electrical, furniture, hardware, home interior, housewares, outdoor living, paints and sundries, plumbing, and sanitary wares, will be available on the internet. Wilcon’s move to expand its presence online was inevitable with the emerging trend of e-commerce. 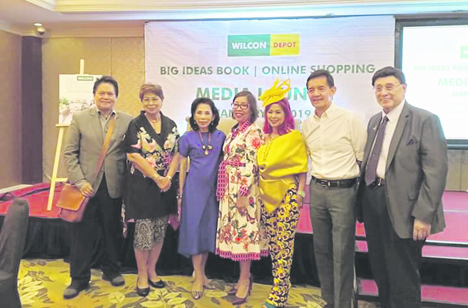 “Customers can now easily build big ideas for their homes through the expansion of our presence in the e-commerce scene,” said Wilcon Depot chief operating officer Rosemarie Ong. For decades now, Wilcon Depot has given many individuals and developers access to an extensive product selection of trusted local and international brands with high-grade features and superior quality, as well as topnotch services. Currently, it carries a wide array of products ranging from tools, sanitary wares, electrical supplies, automotive gear, gardening items, housewares, appliances, paints to living room showcases, among others. Wilcon Depot also offers various add-on services that cemented its reputation as a trusted and reliable firm, even for professionals like architects, engineers, and designers. Today, Wilcon Depot is regarded by many as a topnotch home improvement and construction supply retailer. It has become a household name, a favored destination of firms and homeowners alike, and the country’s ultimate go-to source for all construction needs, whether it’s for a small DIY (do-it-yourself) project, or for the much larger renovation and construction activities. Wilcon shoppers can now browse product information and shop online from Wilcon’s range of home improvement and construction supplies by visiting shop.wilcon.com.ph. One can also stay in touch with by logging on to www.wilcon.com.ph, or the chain’s latest news through their social media accounts at Facebook and Instagram @wilcondepot.com.ph. Despite its move into the online sphere, Wilcon Depot will continue to ramp up the roll out of its nationwide physical infrastructure. New branches to take advantage of the growing domestic economy, are in the works. During the firm’s annual stockholders’ meeting in June last year, Wilcon chairman emeritus William Belo told the Manila Standard that the firm aims to open 65 branches in five years or by 2021. This will require the company to open 24 more branches from 2018 to 2021. Belo said they are planning to open nine branches this year with three branches already opened so far. “We will be opening one branch a month for the rest of the year,” he said adding that the fourth branch will be opened at the end of June and the next one in July. Belo noted that, “the original plan was to complete by 2021 but we expect to complete this by 2020.” He added that they will open seven stores next year and eight more in 2020. Most of Wilcon’s branches are in although Belo said that they are now branching out to areas across the nation where they still have no presence. This includes Visayas and Mindanao. Depending on the format and the location, each store will cost about P180 million to P250 million including inventory. Wilcon still has P4 billion in cash left from the proceeds of its P7 billion initial public offering to fund its aggressive store expansion program. However, the company is not relying solely on store expansion to grow its profits. Belo said they are also adding high-margin products to their portfolio to improve profits. “This will add on our product lines that will give us better margins like lighting fixtures. And we are still getting into appliances and the PPR (polypropylene random) pipings. These are the three major product categories that we want to focus in the next three years,” Belo said.